At Paper Mart, there is no such thing as voicemail. We guarantee that each customer receives responsive and personalized service from a live expert Monday through Friday from 8:00am to 6:30pm EST. Each customer request is handled with urgency, care and precision. The Paper Mart order desk is open until 6:30pm EST for next-day delivery and provides guaranteed turn-around for print requests. Our fleet of 22 company-owned and operated trucks provides fast delivery within a 150-mile radius (NJ, NY, PA, CT) and flexible scheduling. We also offer just-in-time delivery schedules, outsourcing of warehousing needs, and customized inventory management. We can design a customized solution to fit your specific needs. Be customer focused. 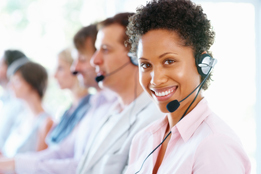 Provide extraordinary customer service at world-class levels. Embrace each customer’s request and fulfill to customer’s satisfaction. React to inquiries and orders with a sense of urgency. Never say “No” to a customer, confer with upper management should you require assistance fulfilling your request. Act in a professional manner, listen before you speak. Provide the most comprehensive service and products available in our industry. Educate our customers with respect to new products and technology. When you control the critical aspects of your business you control your results. Work harder and smarter than our competition. Maintain the highest standards of ethics and principles.